Week 7 of the NFL regular season schedule has been completed, giving us an even larger sample size to delve into just how each of the 2018 NFL Draft first-round picks has fared in their respective action so far. Some of the 32 first-rounders have not qualified for a grade either based on small snap counts or not playing altogether. On the other hand, some players have jumped out of the screen and have helped strengthen their teams. His box-score numbers may not show it, but Baker Mayfield is not only outplaying his classmates, but he’s also outperforming the majority of starting quarterbacks in the NFL. 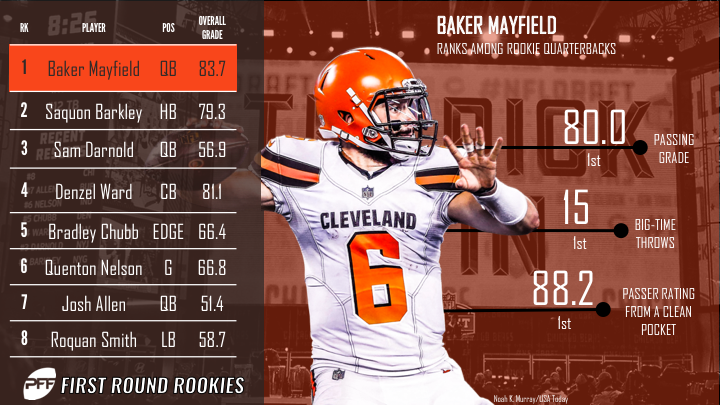 Through seven weeks, Mayfield’s grade of 83.7 is over 25 points higher than the next closest rookie and good for ninth among the league’s signal-callers. The former Oklahoma quarterback continued his stellar work from a clean pocket this week against the Bucs, completing 20-of-31 attempts for 180 yards and two touchdowns and now has accumulated 14 big-time throws from a clean pocket, two more than any other signal caller this year. The New York Giants got yet another solid performance from Saquon Barkley, but it wasn’t enough to lead the team to victory. Does that sound familiar? In Week 7 against the Falcons, Barkley racked up 43 rushing yards on 14 carries, with 42 of those yards coming after contact. He also added another 51 receiving yards on 10 targets. As usual, he was his tackle-breaking self, and he ended the game with six forced missed tackles next to his name. Darnold followed up his Week 6 game, his best game as a pro, with arguably his worst game as a pro in Week 7. On 47 dropbacks, Darnold posted an adjusted completion percentage of just 53.8% against the Vikings, the lowest mark among quarterbacks this week and the lowest single-game mark of the year. As if that wasn’t bad enough, he also ended the game with three turnover-worthy plays next to his name for the second time in five games. Through seven weeks, Darnold’s 11 turnover-worthy plays are the second-most among quarterbacks. In Week 7 against the Buccaneers, Denzel Ward once again showed why he was worthy of the No. 4 overall pick in this past offseason’s draft. Ward was beaten down the field early in the game by DeSean Jackson on a pass that fell incomplete due to an overthrow, but that was one of his few blemishes of the day. Ward went on to play solid coverage and allowed just four receptions from eight targets for 36 yards, while he also added two pass breakups. Through seven weeks, Ward has allowed a passer rating of only 63.4 on throws into his coverage, which is the ninth-best mark among cornerbacks this year. In Week 7 against the Cardinals, Bradley Chubb added two sacks and a quarterback hurry to his impressive pressure total. Through seven weeks, Chubb has now recorded 25 total quarterback pressures, which are the third-most ever recorded by an edge defender over the first seven weeks of a season. Even more impressively, however, is that he’s been the first player to the ball carrier on 26 on his defensive snaps this season, which is the best mark ever recorded by a first-year edge defender.